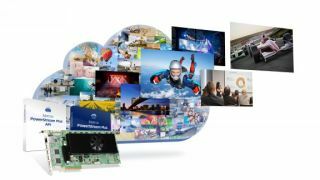 The What: Matrox is now shipping the next generation of its H.264 AV-over-IP portfolio, the Matrox Maevex 6100 quad encoder card. Delivering quad 4K input capture, the Maevex 6100 also offers multiple encodes, variable bitrates, and a broad choice of protocols, allowing simultaneous streaming and recording of four or more channels. The What Else: Matrox Maevex 6100 is a 3/4 length PCI Express 3.0 x8 card with four Mini HDMI (type C) inputs that allow the capture of up to four 4096x2160 at 30Hz sources. Offering RTSP, RTP and MPEG2.TS streaming support with an onboard RJ45 network connector (RTMP support to soon follow), the Maevex 6100 can encode a multitude of H.264 streams at the same or varying bitrates. Capable of simultaneous streaming and/or recording to shared network drives or network attached storage, the Maevex 6100 features programmable start time, recording duration, maximum file length, and file frequency. The Matrox Maevex 6100 quad encoder card delivers 4K/UHD and Full HD multi-channel capture, encoding, streaming, and recording. Built on H.264, the world’s most common codec, this plug-and-play solution fits well into existing infrastructures and interoperates with nearly any device on the network for high-density content distribution and system scalability. The bundled Matrox PowerStream Plus software application and the available API provide flexible management of local or remote data, for full reach and control over the entire network. PowerStream Plus allows access to Matrox’s advanced hybrid streaming (AHS) features, including multiple-source capture, multiple picture-in-picture (PIP), and picture-by-picture (PBP) composite options, and multi-protocol and multi-bitrate streaming. Designed to control all Maevex products, including the Maevex 5100 Series of encoders and decoders, PowerStream Plus allows for the fluid expansion of existing Maevex networks and allows users to pick and choose the Maevex product that best suits their AV streaming needs. The Bottom Line: The flexible communication and reach offered by the Maevex 6100 card and included Matrox PowerStream Plus network management software make it well suited for use in enterprise, government, education, digital signage, or anywhere AV over IP is required.